Houghton Hall & Gardens01485 528569work Historic HouseOne of the finest Palladian Houses in this country. Built in the 1720s, for Sir Robert Walpole, Britain's First Prime Minister. It is a showcase of the work of architects James Gibbs and Colen Campbell complemented by the richly ornamented interiors of William Kent and furnished to reflect Walpole's growing wealth and power. The Hall is currently the home of the 7th Marquess of Cholmondeley, Walpole's descendent, and his family. Situated in traditional parkland, Houghton is home to a spectacular herd of white fallow and other exotic deer. Displayed in the grounds is an impressive collection of contemporary sculptures by world-renowned artists including works by James Turrell, Richard Long, Stephen Cox, Zhan Wang, Anya Gallaccio, Stephen Cox, Jeppe Hein, Rachel Whiteread and Phillip King. Special for 2018 is an exhibition by Damien Hirst: Colour Space Paintings and Outdoor Sculptures 25th March to 15th July 2018. The Damien Hirst sculptures will remain in the grounds until 30th September 2018. The 5-acre Walled Garden includes a spectacular double-sided herbaceous border, a formal rose parterre, a Mediterranean garden, and a kitchen garden with arches and espaliers of apples and pears. There are also glasshouses, antique statues, fountains, Stephen Cox's Flask II, Jeppe Hein's Waterflame and Sir Richard Long's Houghton Cross. The Stables contain a range of original wooden stalls and tack and harness room. There is a fully-licensed café, Gift Shop and a Soldier Museum, which holds The Cholmondeley Collection of Soldiers one of the largest private collections in the world, with 20,000 models displayed. NORFOLK BY DESIGN Pop Up Shop has 45 + local Norfolk artists work for sale until 29th July 2018. One of the finest Palladian Houses in this country. Built in the 1720s, for Sir Robert Walpole, Britain's First Prime Minister. 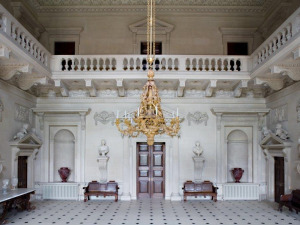 It is a showcase of the work of architects James Gibbs and Colen Campbell complemented by the richly ornamented interiors of William Kent and furnished to reflect Walpole's growing wealth and power. The Hall is currently the home of the 7th Marquess of Cholmondeley, Walpole's descendent, and his family. Please note that regrettably dogs (other than guide dogs) are not permitted.